A 51-year-old man was admitted to the hospital for unstable angina. A coronary angiogram showed three-vessel disease with 70% mid–left anterior descending (LAD) stenosis, 80% left circumflex (LCX)/obtuse marginal (OM) stenosis, and 90% posterior left ventricular (PLV) branch stenosis. Echocardiography showed a severely depressed ejection fraction of 25%; 4 years prior, he had a normal ejection fraction. He had history of lupus nephritis and his creatinine level was 2 mg/dL. The patient was initially referred for coronary artery bypass grafting (CABG). After review of his case in the high-risk surgical conference, he was deemed high risk for CABG and was referred for percutaneous coronary intervention (PCI) of his LAD and LCX/OM and a later staged PCI of the PLV branch. 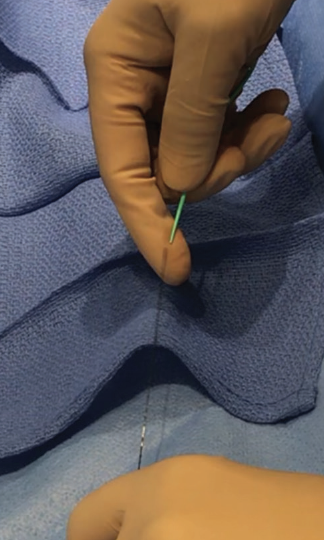 The initial catheterization was performed a week previously through the right radial approach. A comment was made by the physician who performed the procedure about spasm and difficulty passing catheters. We proceeded with PCI. Due to previous right radial access and the comment regarding spasm, we chose to use the Railway™ sheathless guide system (Cordis, a Cardinal Health company). The Railway™ system was used with the Adroit® XB 3.5 guiding catheter (Cordis, a Cardinal Health company). Access was achieved with the needle that comes in the Railway™ kit. The wire was advanced into the radial artery (Figure 1 and Figure 2), and a 0.021-inch dilator with premounted guide catheter was advanced until the wire exited the port (Figure 3 and Figure 4). 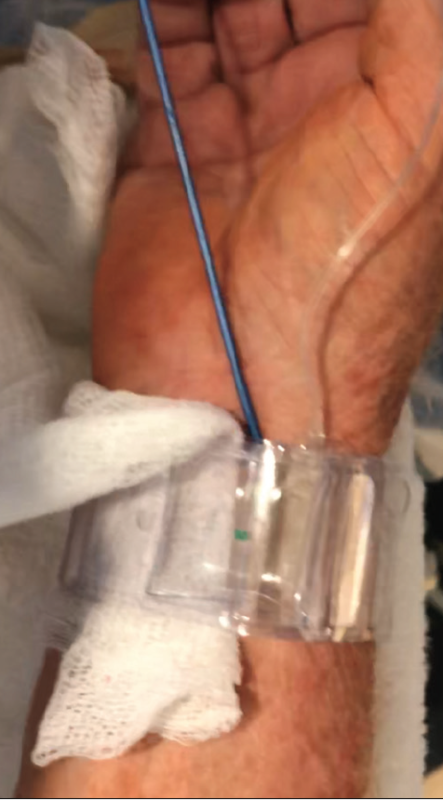 Next, the wire was removed, the dilator was held in place, and the guide was advanced over the dilator until the guide was about 10 cm into the radial artery. 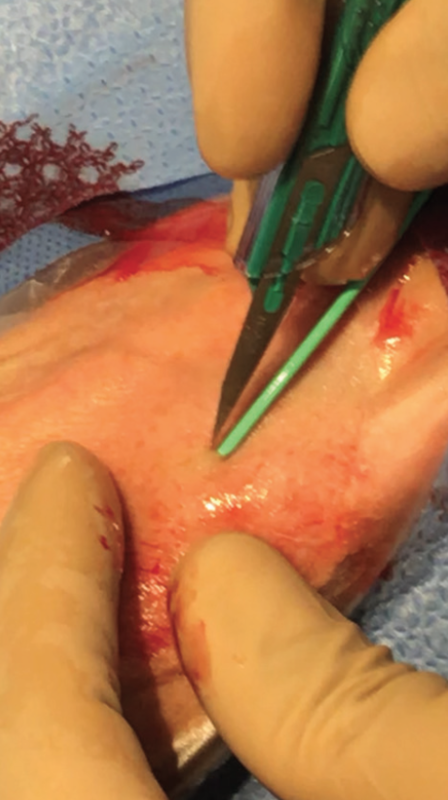 The 0.021-inch dilator was removed and the 0.035-inch dilator, along with a 0.035-inch J-tipped wire, was introduced through the guiding catheter and advanced into the subclavian artery. Having the dilator in front of the guide helped with advancement of the guide without any resistance, and there was no spasm, as was previously experienced during diagnostic angiography. Figure 1. Radial access and a 0.021-inch wire. Figure 2. The Railway™ system with guide being loaded on the wire. Figure 3. Wire exiting the port. Figure 4. Skin nick with dilator in to make a smooth transition at skin entry for the guide that is already loaded on the Pathway dilator included in the Railway™ system. Figure 5. 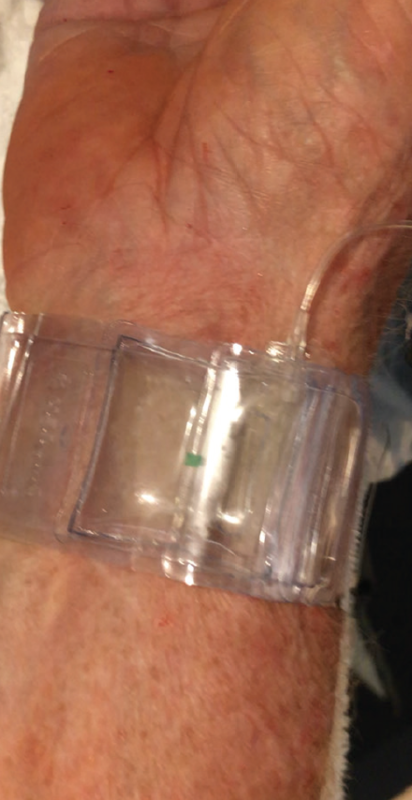 The TR Band® applied with the guide pulled back into the subclavian artery. Figure 6. 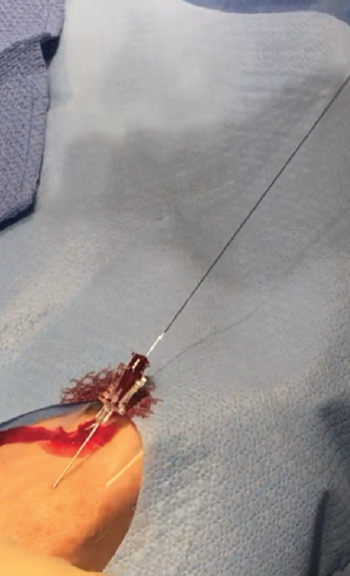 The guide removed over the wire; patent hemostasis was achieved with TR Band® application. At this point, the intervention was successfully performed. After the intervention, the guide was pulled back into the subclavian artery, and a 0.035-inch J-tipped wire was advanced into the guide. 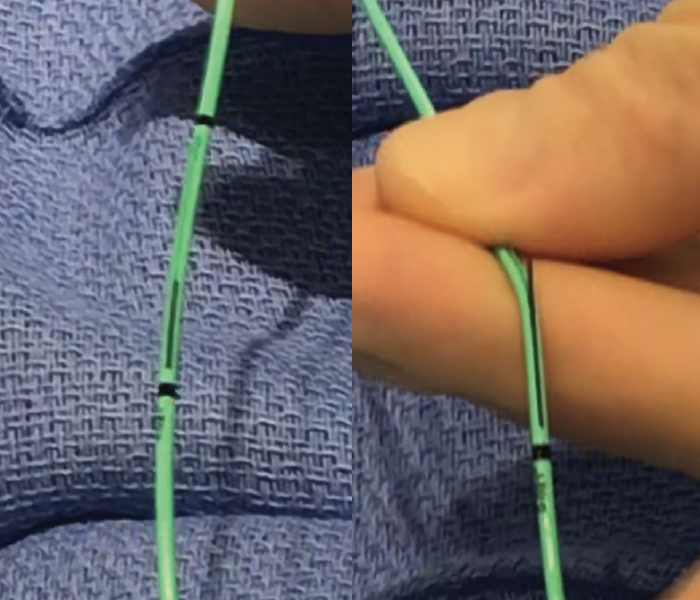 The radial drape was pulled back, and a TR Band® (Terumo Interventional Systems) was applied to the right wrist and inflated (Figure 5 and Figure 6). The guide was removed. The patient tolerated the procedure without any pain or discomfort in the upper extremity. 1. Patel T, Shah S, Pancholy S, et al. Working through challenges of subclavian, innominate, and aortic arch regions during transradial approach. Catheter Cardiovasc Interv. 2014;84:224-235. Disclosures: Advisory board and/or speaker's bureau for Cordis, a Cardinal Health company; Medtronic; and Boston Scientific Corporation.